97% of teachers in The Shadow Project report the majority of their students are more engaged in learning. 78.8% say most students have demonstrated an ability to set and meet goals. “Having Shadow Project as a resource has been the hook that helps build a relationship with unmotivated students. I can’t say enough about how much the Shadow Project has helped me to connect with students and to let them know that they are cared for and valued as human beings. Shadow story becomes a book! 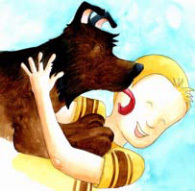 Black Heron Press will publish The Boy Who Learned Upside Down in fall 2013. Written by Shadow founder Christy Scattarella and illustrated by Winky Wheeler, Boy is based on the true story of one child’s journey from “I can’t” to “I can!” and celebrates the courage of kids with special needs. Shadow volunteer 5th grader Maretta helped sort children’s books at the Court’s Kids event. Lynnette Diller’s students at Peninsula School are enthusiastic readers. from our 2012 Teacher Survey on Student Impact show that 74% of students whose goal was to increase reading proficiency this year have made significant program toward their goal. Special educator Grace O’Hanlon at Buckman Elementary thanked Walmart, saying, “My students are more motivated to learn.” Walmart funds also helped purchase new books from teacher and student wish lists, much to the delight of Harrison, a Buckman 4th grader who is proud of how much he has improved his reading skills this year. “Sometimes I go home after school and read for two hours,” he said. In fact, 73% of teachers say students in their classrooms who previously shied away from reading are now motivated to earn books. Thank you, Walmart for supporting our amazing children in becoming confident, engaged learners! Read more. The recent groundbreaking report “Chronic Absence in Oregon”* found a disturbing level of absenteeism among the state’s low-income children as early as kindergarten. But economically disadvantaged children in special education fare even worse. ECONorthwest analysis of data from the Oregon Dept. of Education in 2009-10 found, for example, that 24% of low-income 3rd graders in special ed missed 10% or more of school in 2009-10 vs. 17% of low-income students in the general population. Special educators using The Shadow Project tell us they see very low chronic absence among their students but identified factors that impact attendance, including lack of parental involvement, frustration with learning, and lack of confidence. 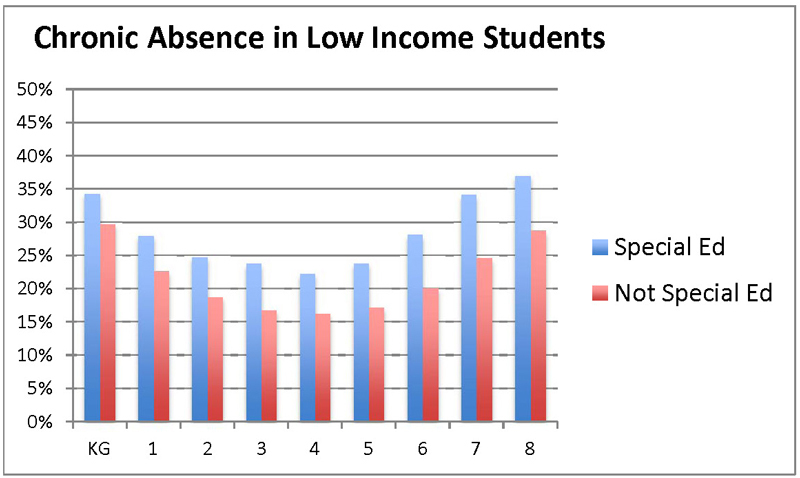 Chronic absence is a strong predictor of a student’s risk of dropping out of school. *”Chronic Absence in Oregon” sponsored by The Children’s Institute, Chalkboard Project, Attendance Works, and ECONorthwest. Last month, Shadow Project volunteers participated in the Court’s Kids annual book-sorting event and took home nearly 500 books for students in our program. Court’s Kids distributes books to special education classrooms in Oregon, as well as Utah, California, and Washington. The organization is named for Courtney Bunfill, who had nearly completed her degree in Special Education when she died in a tragic accident. Her sister, Kiki Grant, is fulfilling Courtney’s dream of helping children with special needs. The NIKE Employee Grant Fund of the Oregon Community Foundation has awarded a $6,400 grant to expand our program to Marysville School. The Junior League of Portland has selected The Shadow Project as a beneficiary of its Portland CAREs program. This fall 20 to 30 League volunteers will spend a Saturday at the Shadow warehouse sorting books and organizing program materials used for our classroom token economies, which help struggling students to achieve goals and build habits for success.